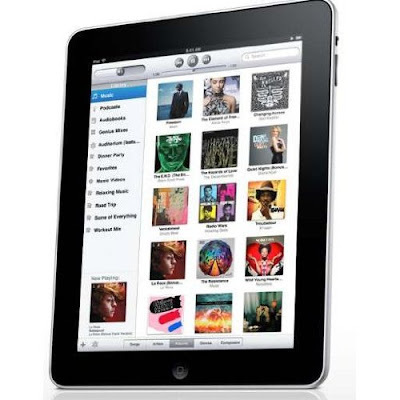 Ipad, where does it fit in? Apple have launched the Ipad now for some time and everybody is quick to jump on the band wagon of pre ordering the tablet or indeed purchasing one from the states. I did not get my hands on one nor do I intend to even purchase one, this is not a review, like most people I'm just starting to get sick of all the hype. I think that the tablet format has been tried and failed a variety of times due to one major problem; we do not have a practical use for it other than a new gadget to show off. It is not a replacement for a desktop computer or laptop, however a good notepad is smaller, costs half the price and does a lot more functions. With a notepad you are free to choose from an abundance of Linux distros or even build your own if that is your pleasure. There is also the added bonus that the vast majority of apps are free and open source. It may play video, music and display ebooks well but it is too big and costly to replace our day to day portable media devices, this is not an ideal fit in your pocket, unless you wear parachute pants. I think we need a defining use and selling point otherwise the ipad and all the others will die off and go down as an expensive gadget gathering dust in most peoples drawers and cupboards. Even the some of my more privaleged pupils who have got their hands on one via wealthy parents are admitting that it seems a bit of a pointless toy, after the initial excitement it is now sitting on their bedside tables. I personally don’t see where they fit in, not a PC replacement, notepads are more cost effective and have more actions and uses. Too big for media devices, I think they will vanish into obscurity within the next couple of years. As parents or potential parents what info should a school website include? As a pupil what do you think should be on a school's website? Before I begin this review could I point out that this dsitro is at Alpha stage and due to a lack of experience with openbox I opted for the XFCE edition. Whilst I was testing this it is not generally recommended that a project at alpha stage should become your primary OS. 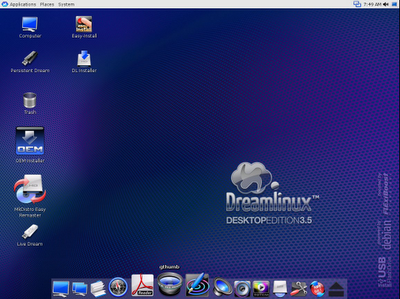 As of Crunchbang 10 the project has moved from being Ubuntu based to being a Debian based distro. 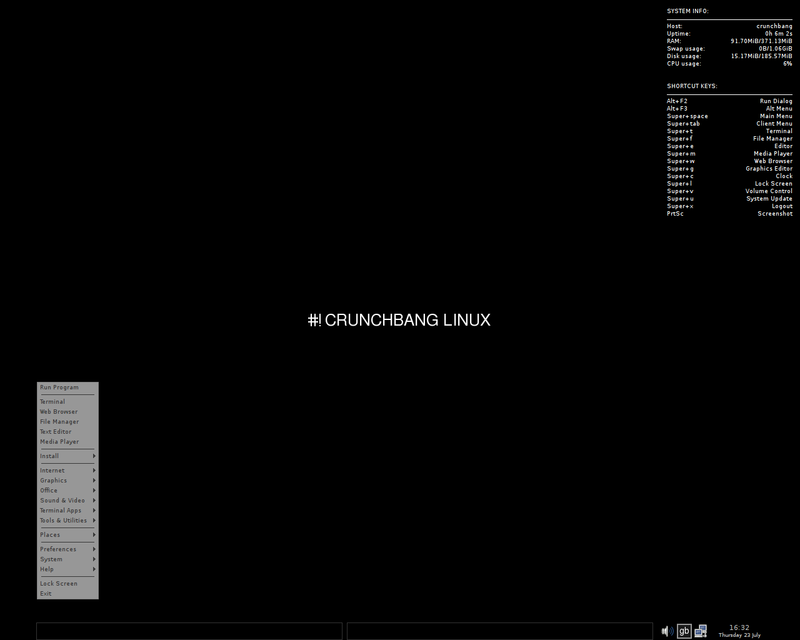 Crunchbang loaded quickly with clean black background, system information on the right of the screen and a system tray in the bottom right. The two large rectangles on the bottom panel are workspaces, I'm not sure if I like this feature, it seems to take up too much room for simply selecting workspaces. All the basics are included in the 1.7GB of installed space to have a fully functional desktop. Iceweasel (Firefox without the copyrighted logo) provides the browsing experience, xchat allows the user to access the IRC channels without any problems, Pino has been included for all your micro blogging needs, transmission provides you with a torrent app (legal and open source only please). Gnumeric and Abiword have been chosen as a lighter and quicker alternative to Open Office. As you would expect with XFCE, Thunar is included. GUI Package management is in the form of Synaptic. The app that gave me the biggest smile was the inclusion of the GIMP. Since Ubuntu dropped it from it's list of pre installed apps more and more distros are leaving it off their initial installs. This is really a shame as the GIMP shows off the highest standard that open source has, this really is a powerful piece of kit. All of these apps worked perfectly out of the box. The internet connection told me that I was offline, but in fact I was able to browse without issue, a pretty small bug for alpha stage. A variety of games were sampled, I downloaded the NVIDIA driver and the 3D games ran very smoothly indeed. Skype was one of the apps that I was needing and I was a bit apprehensive after it failed to load, however a quick trip to the forums and I was communicating with friends ac cross the water. For those of you unfamiliar with XFCE, there is no menu icon in this version, simply right clicking anywhere on the desktop will bring up the application menu, that's the reason it appears to be floating in the above screenshot. The main issue I experienced was with Compiz. It installed fine, but then failed to run. A few fixes were tried but to no avail. I then experienced the hazards of working with alpha stage software: one of the fixes I tried caused the system to fail to load an X environment on the next reboot, I was left with a cursor and prompt. However for alpha stage Crunchbang 10 is remarkably stable and highly usable. But I'm left wandering were exactly does it fit in? At 1.7GB it certainly is not a small distro, probably a bit lite for a complete install, I think it would be an ideal introduction for a user who wants to attempt building up their own distro but does not feel reading for Arch yet. Overall the experience was very good, everything worked out of the box except my graphic card, well that's expected. The issue with compiz will be fixed soon, but be honest this is not the primary thing a user should be looking at when choosing a distro. For a small(ish) distro it does come with a wide array of apps, everything you need to get the basics done on a desktop. 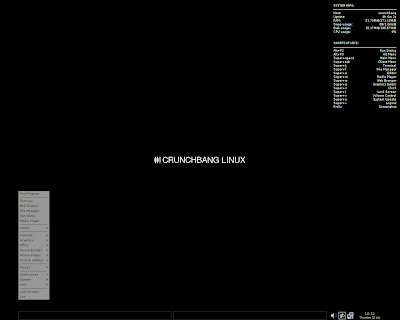 Fancy building up your on desktop but don't really have a good grip of the command line or the confidence, give Crunchbang 10 a go. I have been looking around for a Debian/Ubuntu based distro since Ubuntu has started moving in a direction I don't like; away from the community. I always like to have a Debian based distro as so many new apps come out as deb packages and source code, so testing new apps is a bit easier on a Debian based system. I am also a fan of the Gnome desktop, after trying out Mepis (I couldn't get used to KDE and the sound bugs) I decided to try out Dreamlinux 3.5 Gnome. I had seen this before in distro reviews and heard quite a mixed bag. I personally always thought that it looked like a well set out distro. Upon starting the live CD, no option for straight installation, I was greeted with the purple background, dock with nice icons and animation and the standard Gnome menu at the top. I selected the install icon and was met with a single window, this included all the information needed for the install to commence, a very nice, user friendly touch. As the internet access on the dock was a compass I decided to give it a try, Firefox loaded up but was unable to display the web page. Very odd given that I have a wired ethernet connection, this has never happened with a Linux distro before. It kept on telling me that there were no wireless networks within range: I don't have a wireless card or USB dongle in my machine!!!! The sound was also an issue, I have the Sound blaster Audigy PCI card, not a rare or uncommon card. After tweeking some settings I was able to get sound, but not the quality I was happy with. The graphics card needed a driver download (NVIDIA 6200) however as I struggled to get the internet connection working I was never able to get the card working. Without a working internet connection, after a couple of hours I gave up on Dreamlinux. They have developed a very nice looking distro, there is potential. Being Debian based it should be stable, however the wrinkles in the system need to be ironed out before I would try this again. I'm a big fan of Tom Petty, I really do like a lot of his work. When I was first introduced to his music back in the 90s I also discovered a 'super band' he was part of the Travelling Wilburys. One of their best songs in my opinion was Tweeter and the Monkey Man. On scanning through youtube recently I found this great cover of the Wibury's classic by a band called Fruity Buckfoot, enjoy. If you would like to download the ogg version of this song it is available here. For those of you running windows, the easiest way to play ogg files is to install VLC player.